As we zipped around the narrow, windy roads at 12AM, suddenly the car stopped: “Big snake, haha, anaconda!” said the guide. Sure enough, as I peered out the front of the car, there lay a massive snake in the middle of the road. The guide was thrilled to have caught a glimpse. I, on the other hand, was not so thrilled. Waking up in the middle of the night is never easy, especially when you have nine hours of hiking ahead of you. That is what it takes, however, to make it to the summits of Mount Agung and Mount Batur in Bali, Indonesia in order to catch the sunrise. My body as totally confused by the midnight timing; minor motion sickness even set in as we zipped around the desolate streets while en route to one of the most beautiful sunrises I have ever seen. 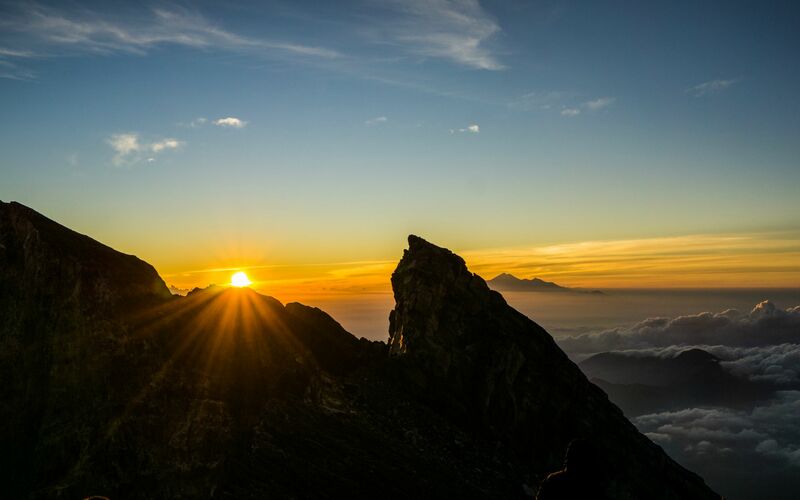 One of the most amazing sunrises atop Mt Agung. 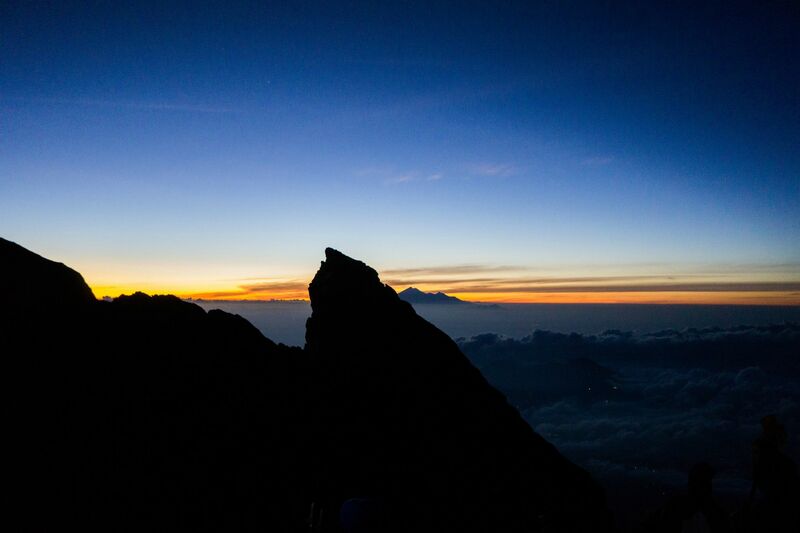 At 3,031 m (9,944 ft) Mt Agung is the highest point on the island of Bali. 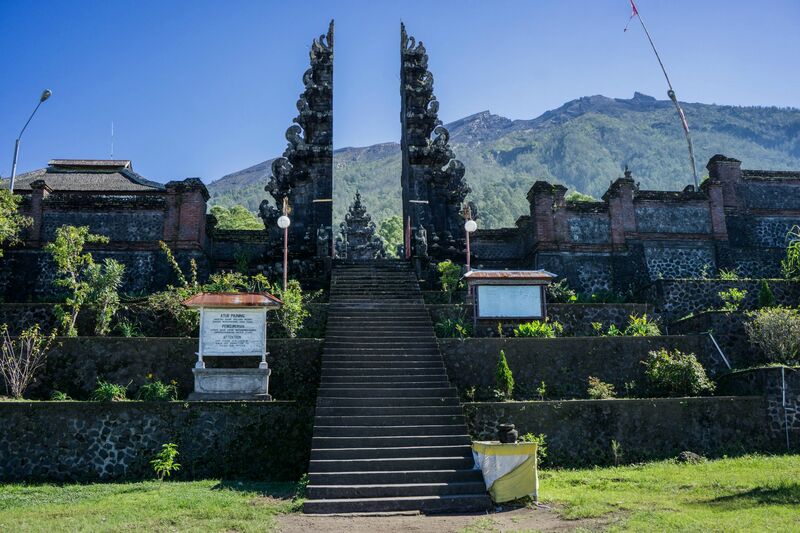 The most important temple on Bali, Pura Besakih, is located high on the slopes of Agung. To many Balinese, Agung is considered sacred, and our journey began with an offering to the gods at the temple of Pura Pasar Agung. The sunrise trek begins with a prayer and offering at Pura Pasar Agung (temple). There were five hikers and three guides for our trip, including two local guides who were knowledgeable about the route. After our offering at Pura Pasar Agung we entered the forest where our journey began. Two hours of forest trekking led us to the edge of the tree line and high enough to see the surrounding city lights. It was a surreal experience being able to see the city lights mixed with the many (shooting) stars. Although it was not quite high enough for altitude sickness, the elevation definitely had an impact and I found myself breathing unnecessarily heavily during certain parts of the trek. In hindsight, this was the highest elevation I have ever been in my life. Trekking above the tree line, it is another two hours to the summit of Agung. Almost thankful that we were unable to see our surroundings (due to the darkness) the trek gets fairly steep, and oftentimes we had to maintain three to four points of contact for safety. I knew we were near some deep crevasses as the light from my headlamp would often be lost in the darkness. Also, I was glad to have prior rock climbing experience, and leveraged useful techniques throughout the trek. We reached the summit at around 6:15am and the view from the summit was absolutely stunning. Watching the sunrise above the clouds, with Mt Rinjani (on the nearby island of Lombok) looming in the distance, was one of my favorite experiences so far on our entire trip. Looking west, I was able to see many of the surrounding cities as well as the massive shadow that Mt Agung casts on the island during the morning hours. Reaching the summit around 6am means you get this view. It was freezing at the top! My guess would be around 5 degrees C (40 degrees F) Luckily, I was prepared with hat & gloves, but many others were wearing shorts and t-shirts and were shaking in their boots. The trek back to the base was equally as challenging and took all of 4.5 hrs. It is funny, how no one ever writes about the descent. In my opinion, the views were equally as stunning on the descent (especially since the entirety of the ascent was in darkness). The clouds continued to linger around the tree line and the first two hours of descent provided breathtaking views of the surrounding areas. Enjoying the view during my descent - equally as stunning as the view from the top. Similar to Mt Agung, Mt Batur is an active volcano on Bali with elevation of 1,717 m (5,633 ft). It offers a similar sunrise trekking experience and is the safer, shorter, and more visited option of the two mountains. 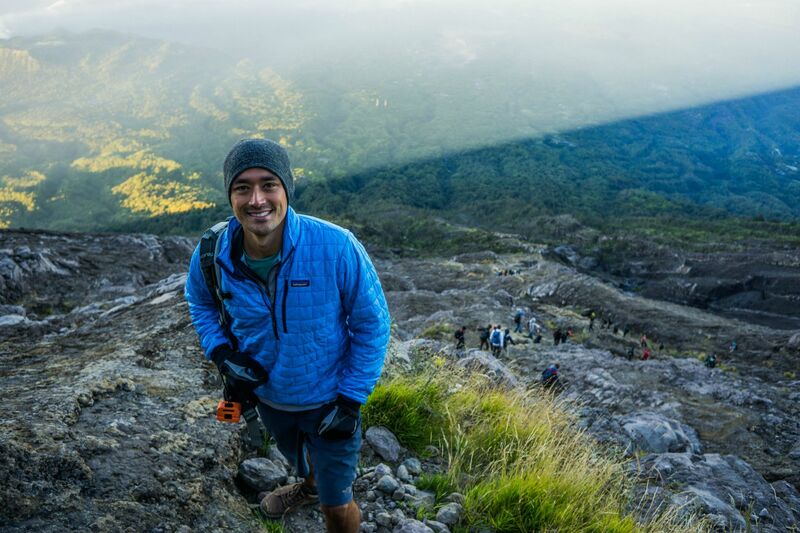 The views from the top are equally as stunning as Agung. 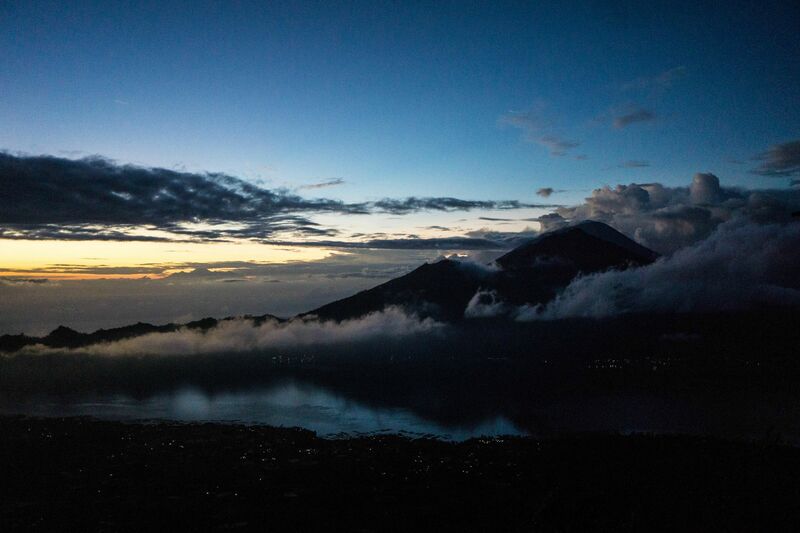 View from Mt Batur, just prior to sunrise. 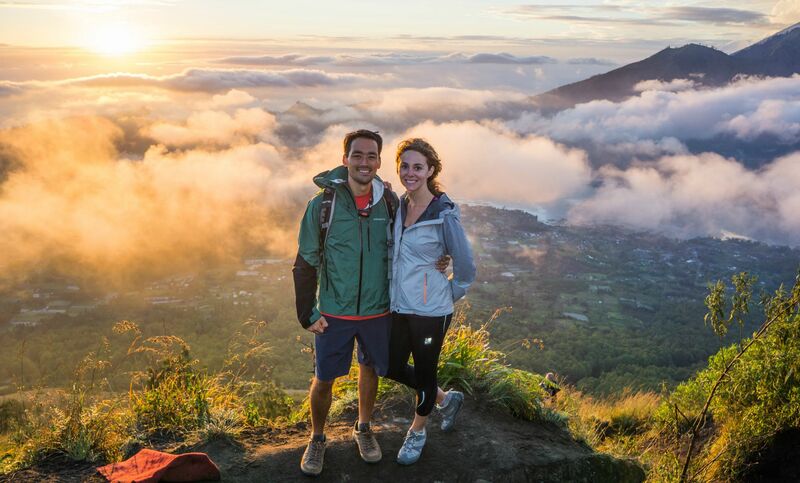 After trekking Mt Agung I was excited for Natalie to join me in the ascent of Mt Batur. We awoke to the sounds of pouring rain and were picked up by our guide at our hotel at 2:30am. Our group was roughly 10 hikers and three guides, however, there were many groups on the trail. The trek begins similar to Agung in terms of starting in the forest and eventually reaching the volcanic rock. Whereas Agung was almost exclusively volcanic rock near the summit, Batur was essentially sand, and every step forward literally feels like two steps backwards. Upon reaching the summit, it was another incredible view as we were able to see over Lake Batur with an unobstructed view directly east at the sunrise. We watched morning dew evaporate from the ground and the clouds roll in and engulf the mountain – it was a truly surreal experience! Surreal sunrise atop Mt Batur. The descent featured a pit stop for coffee and snacks as well as the chance to visit the nearby geysers (and hang out with some monkeys). While I enjoyed both treks, they each provided unique experiences, and I am thankful and lucky to have been able to enjoy the views from the summits of both Mt Agung and Mt Batur.